White Eagle Martial Arts will give you the key to unlocking the incredible intelligence, talent, and resources within you. White Eagle Martial Arts will build your mind, body, and non-quitting spirit. 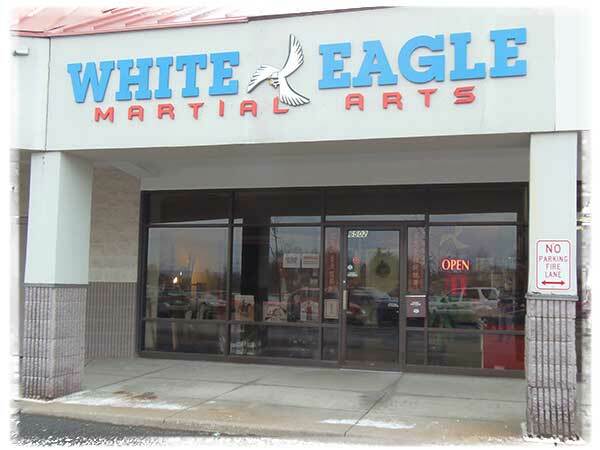 White Eagle Martial Arts provides the most exciting and innovative programs YOU will ever experience. YOUR potential is unlimited! You have dreams-you have goals. You know that your life could be a masterpiece. But, how do you unlock your potential? Do you have a plan or are you hoping it will happen? It will give you a proven formula for success in every area of your life! It is time for the doubting to stop, and for you to start. Our classes are tiered by age and experience so you can work out at your own pace in a comfortable atmosphere. All testing is done at our Morgantown, WV dojo and rates are very reasonable. Contact Us now for more information! Now you have the opportunity to see for yourself what happens to your child when their true potential is released. It’s an opportunity to join a winning team of dedicated individuals who are all striving to be the best they can be through the study of the White Eagle Martial Arts System. White Eagle Martial Arts provides the most exciting and innovative programs YOU and YOUR child will ever experience in the area of child development. When answering the question, "What do you expect your child to gain from the study of the White Eagle Martial Arts System?" the majority of parents indicate that they want their children to learn the values taught at White Eagle Martial Arts: respect, responsibility and self-discipline. If you are a parent searching for ways to counterbalance the negative messages bombarding your children from movies, television, and other forms of pop culture, search no further! Now you have the opportunity to join the thousands of people (of all ages!) who have enhanced their quality of life through the White Eagle Martial Arts system- a system that blends character development, fitness and self-defense into an oasis of rejuvenation for you! Many people live a life of quiet desperation. It is very unfortunate to see people walking around being tired, unfocused, stressed. They feel out of control. They are trapped in the hypnotic conditioning of their fears, doubts and worries. A typical day is spent going to work, dealing with the constant hassles of putting out fires for nine to ten hours per day, skipping meals, and rushing to get home to sit in front of the television and forget about the daily grind. Week after week this habit goes on. The weeks turn to months and the months to years. Over a period of time you become conditioned to believe, "Well, that’s just the way it is, there’s nothing I can do about it."" Helplessly you continue doing what you’re doing, feeling as if just hanging in there is the answer. Ever wonder what to do if you are attacked? 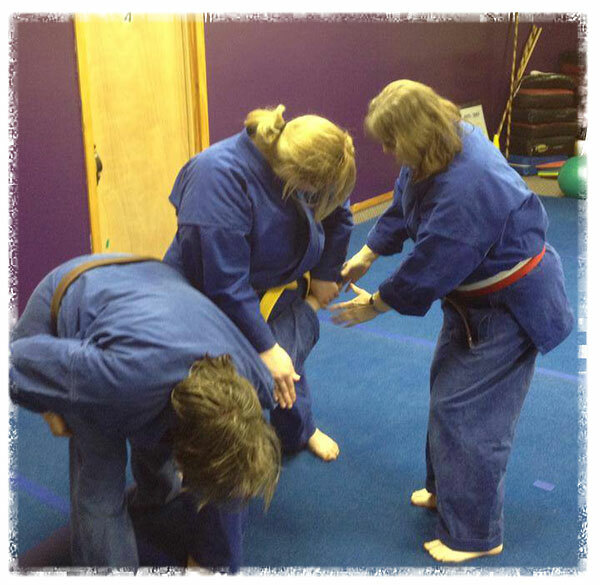 White Eagle Aikido offers a class specifically designed for Women's self defense. In a class led by Sensei Mark Favaloro you can study self defense in an enviornment that is comfortable and adjusted for your needs. Martial Arts is a way of life that will improve your overall well being. 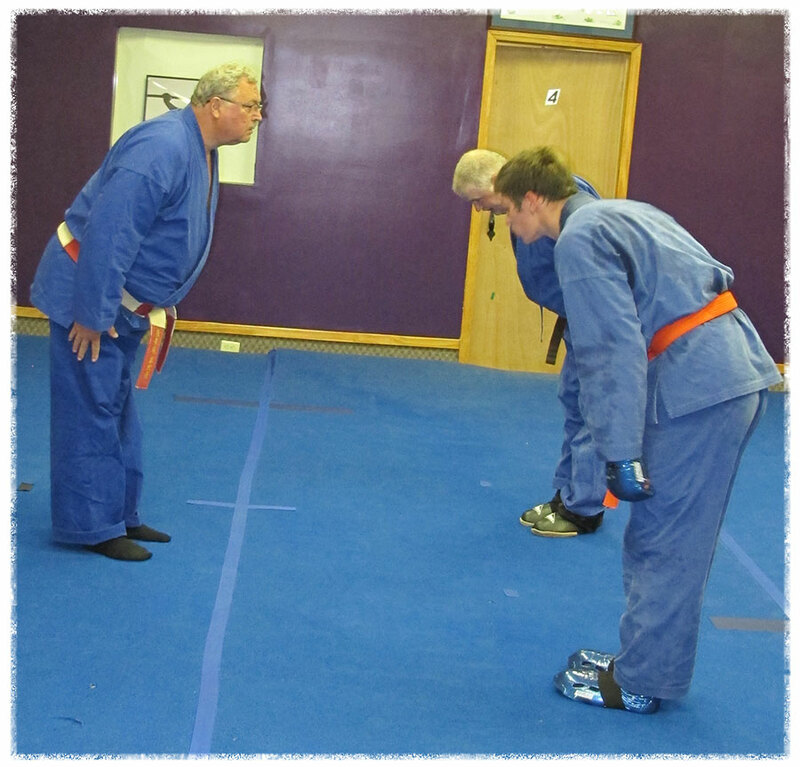 In the beginner class will teach you the basic techniques, drills, and kata that you will be able to expand on. You will learn the building blocks that will allow you to protect yourself and your loved ones, as well as improving your physical fitness and mental well being. After completing the beginner Martial Arts Class you may be evaluated by Sensei Cummings to move into the Intermediate adult class. 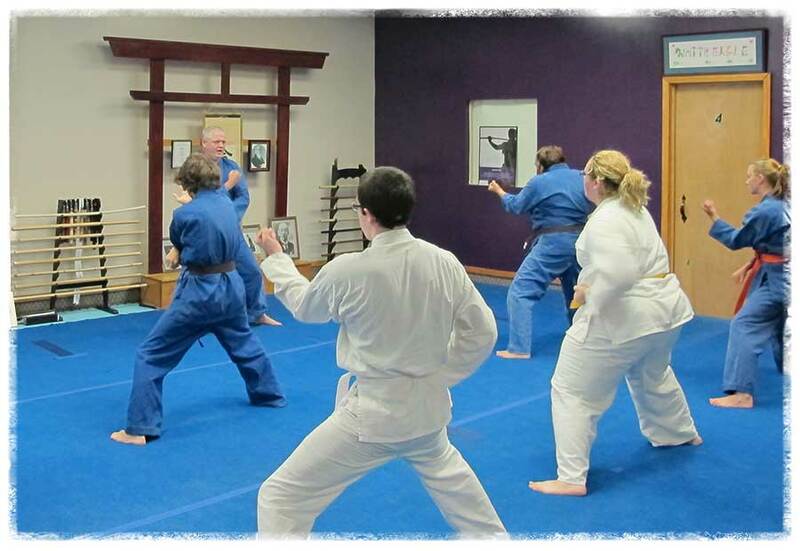 The beginner Martial Arts Class is 1 hour long, twice a week for 1 month. Monday 7:30pm - 8:00pm Advanced Class. Must be an Orange Belt or higher to attend the advanced class. Wednesday 7:30pm - 8:00pm Advanced Class. Must be an Orange Belt or higher to attend the advanced class. At White Eagle Martial Arts we teach the art of Bai Ying Pai which means White Eagle System. It is an eclectic art form developed by Master William O. Cummings who has dedicated over 40 years of his life to the study of Martial Arts. Master Cummings has trained with many of the pioneers of martial arts including Masters Glenn Premru, Sam Pearson, Ted Volrath, John Hamilton, Tom Turcotte, Gene Thorner, Tony Farrell, and Roriko Masatani. Master Cummings became proficient at Kung-Fu and Karate along with Judo and Aikido and after many years of using these styles a natural blending occurred. This mass of knowledge included four different styles of Karate, three styles of Kung-Fu, plus Judo and Aikido leading to the development of a total system. Bai Ying Pai incorporates the hard, straight line, interceptive movement of Karate with the soft, flowing, re-directive movement of Kung-Fu, and combines these with the throws, falls, and grappling of Judo and the joint locking, and projections of Aikido. After years of success at tournaments from Pennsylvania to Texas Master Cummings was encouraged by many of the above named Masters to develop his own system, which was recognized as an official style at the Okinawan Karate Federation meeting in Ontario Canada in March of 2002. Although the style is relatively new, we maintain our traditional values and many traditional Katas from Shorin-Ryu, Pai-Lum, Hung-gar, and Wai-Lum. Master Cummings has found many parallels between his system and Jeet Kune Do (JKD) developed by Bruce Lee. White Eagle's traditional teaching produces disciplined, confident students who have learned how to set and achieve goals, earn respect and accept responsibility. 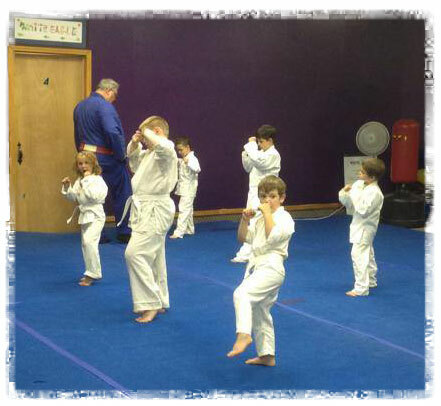 We welcome people of all ages to become part of the Martial Arts tradition of achievement through hard work. All of our instructors are professionals who have developed their skills and knowledge to offer the highest quality instruction. 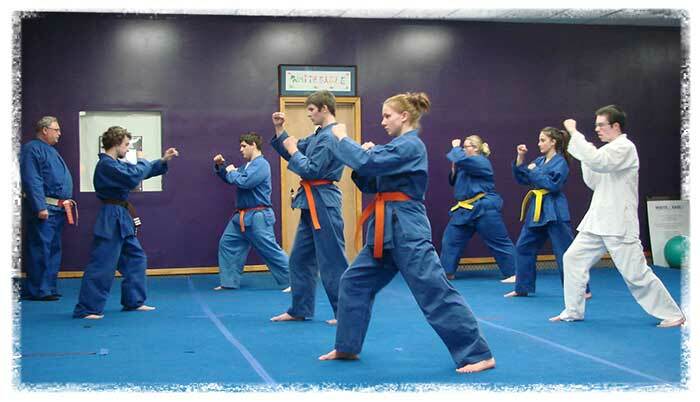 They are approachable, caring, and possess a true love for teaching martial arts. After taking just a few lessons, you will see why White Eagle Martial Arts is Morgantown’s choice for traditional martial arts. 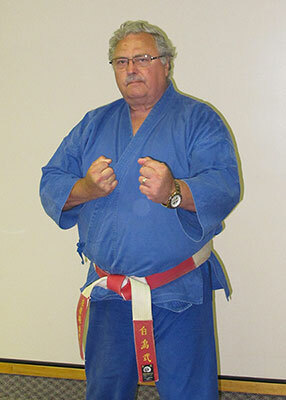 Master William O. Cummings, who is known as Sensei by thousands of people in the Morgantown area, has been teaching Martial Arts in Morgantown since 1980 and started studying martial arts in the early 1960’s. "I have been fortunate enough to get to study with many of the best Martial Artists available like Glenn Premru, Sam Pearson, Daniel Pai, John Hamilton, Tom Turcotte, Ted Volrath, Gene Thorner, Roriko Masatani, ‘Xiomin Jin, Toni Farrell. What a wonderful education in Martial Arts ‘I received from this diverse group. 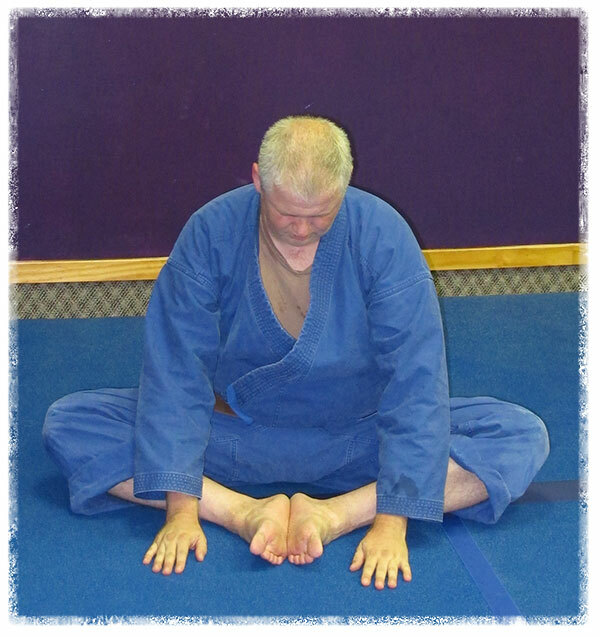 With over 40 years dedicated to ‘ the study of the Martial Arts I was able to blend Karate, Kung-Fu, Judo, and Aikido into one of the most comprehensive systems to be found, one that was internationally recognized by the Okinawan Karate Federation. I have found that I have come to many of the same conclusions as Miyamoto Musashi, "You must study the ways of all professions to learn the true way," and by Bruce Lee who also developed his own system from the study of many. I pride myself in keeping the old traditions alive while taking advantage of modern equipment at the same time. I still look at Martial Arts Training as the tool we use for self improvement; confident people with active minds, good self esteem who have learned how to achieve goals through hard work and perseverance develop leaders that you can be proud of." "At White Eagle we have a written curriculum, experienced instructors a top of the line facility. Rank is not given freely, it is earned, that’s why our proud group of students holds their heads up high when they say "I am what I am because I choose to be. I am an Eagle by choice …"
Sue Hartzell, White Eagle’s most dedicated student, started at White Eagle in the early 80’s. She already had a Brown Belt in another system, but Sue obviously liked what she found at White Eagle, since she continues with us over 25 years later. Sue was part of an early SIT class (student instructor training) that put us on the map. Her class traveled all over the country loading-up on trophies. Over the next three years, Sue placed in the top three in every event she entered, including a first and a third at the Okinawan Karate Federation international tournament in Corpis Christy, TX. Sue is known for her un-canny ability to remember Kata (pre-determinded sets of techniques passed down for hundreds of years). She keeps about 40 of them in her head and thus has the title of chief kata resource for the school. She is a well rounded Martial Artist with individual Black Belts in Shorin-Ryu Karate, Pai-Lum Kung Fu, Judo, and Aikido and Master rank in Bai Ying Pai. Her first love is probably Aikido and many audiences have been dazzled by her expertise as multiple attackers go flying everywhere during demos. During the day, Sue is a Physical Therapy Assistant at Health Works. If one asks the question … "Do you think Martial Arts can get you in shape?" Mike says the answer is definately "Yes!" 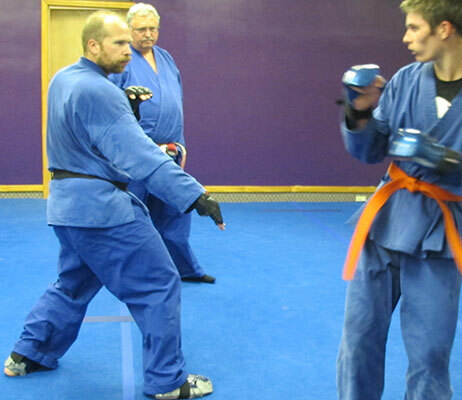 Mike has been with White Eagle Martial Arts since 2005. Mike knows how to put the emphasis on "work in and work out." Mike has always taken instruction the way it should be. If you point something out that needs worked on in class, he takes action and has it corrected by the next class. Mike realizes that you get what you put in and gives 110% all the time. Mike’s teaching method is to lead by example, and it is a good example at that. By the way … in his quest for perfection in Martial Arts, he has lost more than 100 pounds! During the day Mike is a Software Engineer at Move, Inc. When Mike is not flying through the air at White Eagle Demos, you may find him flying with the help of wings. He has his pilot's license!